Sergei Rachmaninoff's long and meaty fingers, capable of playing intervals of a 12th, plied these keys, they say. Maybe he sat in front of them and whizzed through the classic Hanon and Czerny exercises, as he used to do before concerts. Maybe he practiced on them in his special way: excruciatingly slowly, perhaps 20 seconds for a measure of Chopin. Why not? They say this nine-foot Steinway-D grand piano, serial No. 261324, belonged to that great Russian composer and piano virtuoso. But the instrument is not in the home of a wealthy piano aficionado or in Steinway's basement or in a famous concert hall. It is perched above the Hudson River near the George Washington Bridge, hidden away in a dormitory of Columbia University's medical school, the College of Physicians and Surgeons. The piano's existence is almost completely unknown outside the college. And an examination of the evidence raises questions about its provenance. But within the school it has achieved near-mythic status, particularly among its vigorous musical community, from pediatrician pianists to composing pathologists to singing second-years. They have passed down the piano's beloved story, teacher to student, for more than five decades. "It's fun to think that your fingers are running over the keys that were touched by the great Sergei Rachmaninoff," said Dr. Andrew G. Frantz, a professor of medicine and the dean of admissions. A 1955 graduate of the school, Dr. Frantz is a pianist and violinist. The story goes that the piano ended up there while or after Rachmaninoff was a patient at Columbia-Presbyterian Medical Center, as the teaching hospital was then known. The piano's pedigree is more than just a nice tale. The medical school uses it to attract musically inclined applicants, part of its goal of producing well-rounded doctors. The Rachmaninoff identification was also mentioned in fund-raising efforts to restore it and several other medical school pianos, and to renovate practice rooms. The Rachmaninoff piano is kept in a music room named for Clyde Wu, a 1956 alumnus, and his wife, Helen, at Bard Hall, the dormitory. Dr. Wu, also a Columbia University trustee and a music lover, said he knew about the piano as a student; Mrs. Wu, a pianist, studied with a well-known piano teacher, Olga Conus, who knew Rachmaninoff. The couple contributed $40,000 to renovate the room and restore the Rachmaninoff piano. Mrs. Wu was moved, she said, by the piano's poor condition. "The kids bang on it, and they put Coca-Cola bottles on it," she said. "I could hardly bear it, to know it was Rachmaninoff's piano." Mr. Wu added, "We said, 'O.K., we'll finance it, and you restore it.' 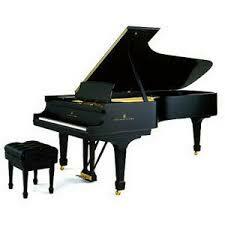 "
Eight years later the piano gleams, its sound rich and booming, its keys malleable to the touch. Students and members of the faculty use it regularly to practice. "It's a gorgeous instrument," said Dr. Marc Dickstein, an accomplished pianist and an associate professor of clinical anesthesiology, after running through Schubert's Impromptu in A flat (D. 899, No. 4) at a swift tempo. "It can be difficult to tame," he said of the piano. "It's got a big sound. Overall, for where it is and the amount of use it gets, it's a pretty amazing instrument." On the first Monday of each month, the piano is wheeled into the main student lounge, with its Hudson River view, for chamber music concerts sponsored by the Musicians Guild, a student-run organization. The guild also organizes a yearly orchestral concert. The activities are part of a musical life that students and faculty say is unusually vibrant for a medical school. The Bard Hall Players put on musical theater productions, recently including "West Side Story." The Ultrasounds are a male a cappella group. Every year a string quartet is put together to play instruments made by Dr. Virginia Apgar, who gave her name to the Apgar score, the universal evaluation for newborn health. She was the medical school's first female full professor and had a sideline as a luthier. Some musically inclined students said the piano's reputation drew them. "That was a big factor for me choosing Columbia," said Carl Fisher of Glen Ridge, N.J., a third-year student and a singer. He, like many other fellow students, quickly learned about the Rachmaninoff piano. The story is fuzzy, and some medical school officials stress that it was always based on rumor. Mrs. Wu said she had heard the piano was taken to the hospital for Rachmaninoff's use while he was a patient there, and that it never left. Others said it was Rachmaninoff's piano but was donated by someone else. Dr. John Truman, a pediatrics professor, said he believed that Rachmaninoff, who died in 1943, willed the piano to the medical school. Others said the piano also once belonged to Arthur Rubinstein. "We can find no proof that Rachmaninoff donated it, or that it was donated by somebody and it was Rachmaninoff's piano," said Stephen E. Novak, the head of archives for the university's health sciences library. Steinway's records show that the piano was completed on Dec. 14, 1928, and was sold to Marc Eidlitz & Son, the company that built the medical center. The records show that it was delivered to Bard Hall on Nov. 25, 1931, several months after the dormitory had opened and three years after the hospital had begun receiving patients. Could Rachmaninoff, who suffered from headaches and nerve problems in his fingers, have spent time at the hospital? That is difficult to determine. New York-Presbyterian Hospital, as the institution is now called, said patient records from the period had been destroyed. Memoirs by a cousin, Sophia Alexandrovna Satin, speak of an operation on Rachmaninoff at a New York hospital in 1921, without saying which hospital, according to a Rachmaninoff scholar in the Netherlands, Elger Niels. At the time the composer was busy performing in the United States and abroad. During the 1920's and 30's, he lived on Riverside Drive and West End Avenue. But one fact offers a tantalizing clue. The piano was designated a concert instrument, meaning it could have been in the pool that Steinway reserved for major artists (including Rachmaninoff) to choose from for performances. Perhaps that association gave rise to the Rachmaninoff legend. When told what the records showed, Dr. Truman said, "I liked my version better." I have a wonderful CD issued a few years ago by DG of Mikhail Pletnev playing Beethoven: Sonata for Piano No 26, 'Les adieux'; Chopin: Andante spianato and Grande Polonaise; Mendelssohn: Andante cantabile and Presto agitato; Rondo capriccioso, Op. 14; Rachmaninoff: Variations on a theme of Corelli, Op. 42; 9 Etudes-tableaux, Op. 33 - No. 6 in E flat minor; No. 8 in G minor; No. 9 in C sharp minor; 9 Etudes-tableaux, Op. 39 - No. 5 in E flat minor; all on Rachmaninoff's pre-war Steinway, not the one mentioned in the above article. The sound of the piano is gorgeous -- SR really knew how to pick 'em! pizza wrote: I have a wonderful CD issued a few years ago by DG of Mikhail Pletnev playing Beethoven: Sonata for Piano No 26, 'Les adieux'; Chopin: Andante spianato and Grande Polonaise; Mendelssohn: Andante cantabile and Presto agitato; Rondo capriccioso, Op. 14; Rachmaninoff: Variations on a theme of Corelli, Op. 42; 9 Etudes-tableaux, Op. 33 - No. 6 in E flat minor; No. 8 in G minor; No. 9 in C sharp minor; 9 Etudes-tableaux, Op. 39 - No. 5 in E flat minor; all on Rachmaninoff's pre-war Steinway, not the one mentioned in the above article. Indeed, and Steinway knew how to build them with those special qualities back then. Oh my! I guess I know which Medical School I will be applying to next year!!!! Looks like I might have a little bit of an edge being a Classical Pianist and Church Organist if I apply to Columbia. ch1525 wrote: Oh my! I guess I know which Medical School I will be applying to next year!!!! And you'll be in New York!!!! !